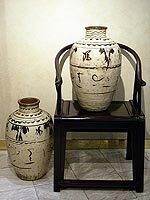 The cizhou is a kind of Chinese ceramic, who knew a production increase during the Song dynasty (960 - 1279), especially the Northern Song, during the XI and XII° centuries. 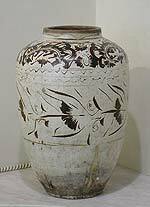 Cizhou was the former name of a south region of wood stove in Hebei, and the process of Cizhou ceramic production consisted in a translucent glaze laid down on a white slipware, which adapted to elegant and plain shapes. Later on, this process was getting more varied. Apart from the Hebei stoves, many other ones, located in Henan and other sites produced also solid cushion, vases, bottles, jars and other containers brush decorated in brown, black, grey on white background, creamy, leather-colored or sometimes, turquoise. The pale background of the ceramic was obtained from a slipware (semi-liquid slip) which was applied to the material before cooking. As opposed to the colorful models of the other dynasties, the Song preferred the Confucian way of thinking about the noble rules. That is why they adopted a moderate but refined design. 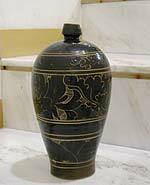 Due to that fact, the Cizhou are mostly monochrome with plain decoration patterns. 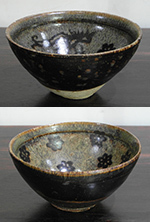 The typic Cizhou ceramic is a variety of stoneware, grey or leather-colored, recovered with a milky white glaze. The common process consisted in cutting the decoration patterns inside the slipware until the dark part of the object was showing. This pattern may be left as it is or brown-painted, so that the color and the relief is emphasized. Then, the whole article was coated with a transparent covering material. The most recurrent topics of these decorations are floral, but sometimes they can be fish, birds or even landscapes with various figures. Some stoves of Cizhou sites are still maintaining these traditions to this very day.